My apologies for making you wait, dear readers, to hear all about the other wonderful food encounters I had while I was in Philadelphia. If reading about the deliciousness of the Starr restaurant empire didn’t make you want to hop on a plane or jump in the car and head over to the city of Brotherly Love, then perhaps there will be something here that will push you over the ledge. 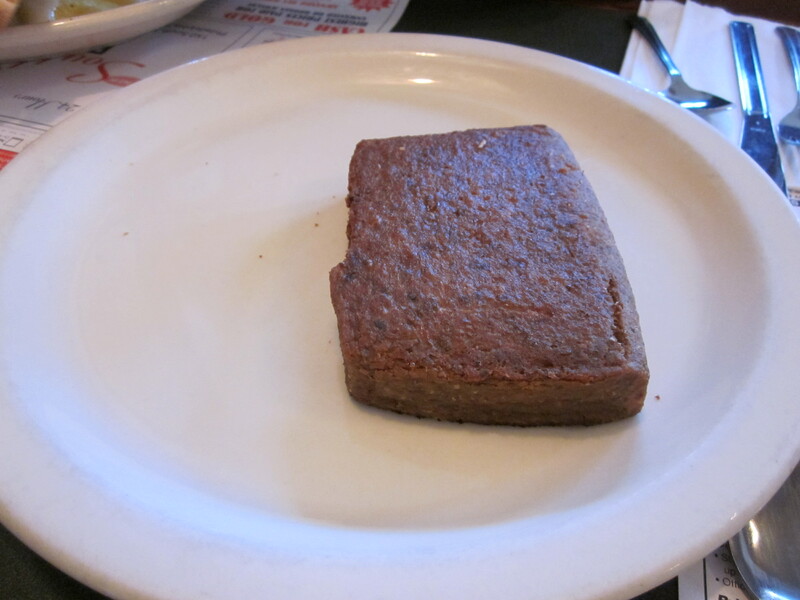 Or reading about scrapple may be enough to put you off the local diners for good. Try to keep an open mind, though; you just never know. But let’s not start with scrapple. I’m excited to tell you about Reading Terminal Market. Ladies and Gents, Reading Terminal Market is enough to make me want to move to Philadelphia and work in, if not live near, Center City. Just so you don’t look like the full-blown tourist that I did, it is pronounced “Redding” and not “Reading” (like you would a book). We weren’t corrected until we asked, so clearly they get that mistake often. I’m sure it identifies you as a tourist more clearly than a neon arrow pointing at your head might so I’m glad to help you out. Reading Terminal Market is pretty much my foodie dreams come true in one building. It is a HUMONGOUS structure devoted entirely to food in various formats. It is laid out in blocks with street signs hanging from the ceiling to help you navigate your way. There are the wee farmer’s markets and the more typical grocery store-type areas of produce and pre-packaged granolas and mixes of that sort. There is an entire Amish section of meats, cheeses, pastries, pickled foods, and bread. There are butchers, fish counters, cheese counters, olive counters, pasta counters, and even a couple of trinket shops. There are a couple of general seating areas, and most of the restaurants have counter seating. There are restaurants galore: Mediterranean, Cajun, Middle Eastern, Mexican, gyros, coffee, bakeries, crepes, a diner, pretzels, and more. We ate the most amazing pretzel dogs from Miller’s Twist, y’all. Seriously, my mouth just watered a bit thinking about them. The pretzel was soft and chewy, the dog was hot and juicy, and there was melted cheese inside that brought the whole thing together. Mmm…mmm…good! Lunch one day came from Olympic Gyro which was super fast and quite delicious. The fries were a french fry lover’s (as I am!) dream: crispy-crunchy, salty, not overly greasy, but just a bit. They were the good rectangular kind that frequent high school cafeterias or mall food courts. Don’t judge – if they are cooked right, they are quite tasty. The gyro was also really quality. I love a good tzatziki sauce which they had, and they didn’t put too many onions on there, which I don’t love. I give it 2 forks up! Metropolitan Bakery had these cute, little single-serving rolls that I appreciated so I didn’t have to buy a mamajama loaf of bread. I particularly enjoyed the rosemary olive oil roll. Now you try to say that 3 times fast. It’s tricky to get out even once! I may give those a go in my own kitchen. Seriously, friends, it made my heart both happy and sad just to walk the aisles of this place. There was so much food everywhere and so much of the kinds of food I love. Yet, I couldn’t buy it because I was going back to a hotel. Where on earth was I going to put a hunk of salmon, pray tell?? The Market is amazing, and you should be sure to go and go more than once when you visit Philly. Please forgive my lack of photos. I was too “in the moment” to take pictures every time I was in there. 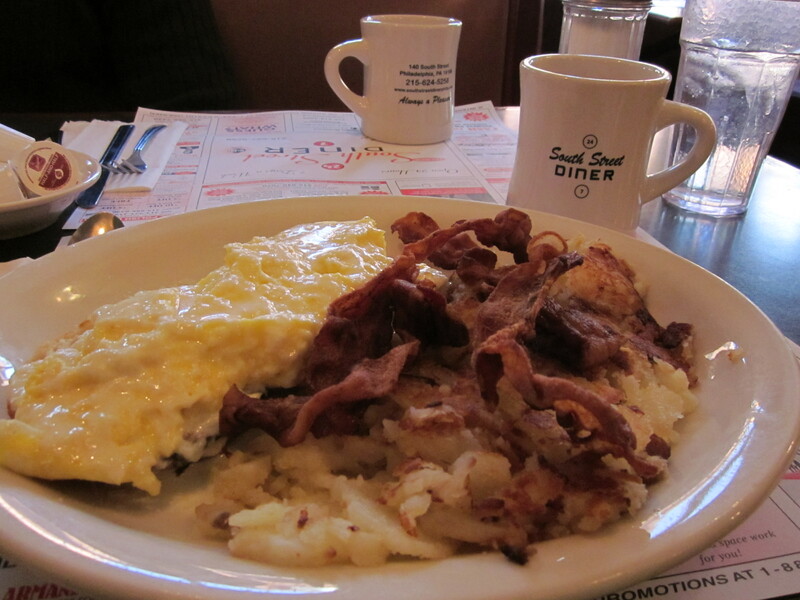 And last, but definitely not least, we visited South Street Diner. This place can cook some crispy bacon! Can I get an amen, Stacey? Seriously, y’all. I’m a crispy bacon eater so I specified, and boy, howdy, did they deliver. I feel very strongly about this as a positive recommendation. It wasn’t burned which sometimes restaurants think is an acceptable substitute for crispy. Burned and crispy are sooo not the same thing whatsoever. There was much happiness when the crispy bacon arrived. Check out the crispy bacon! With the crispy bacon also came…<cue drum roll>…scrapple. Ahh, yes. Let’s talk scrapple, my friends. I’d seen it on several menus, and it was all over this diner menu. I asked Bailey, my Philly native friend, what it is, and he begins to extol the deliciousness of scrapple and how it’s a Philly delicacy and he will be ordering some so that we can all share and partake. Yes, but what is it? Well. Hold on to your plates and forks. Before we get to the nitty-gritty, you should know that the waitress is prohibited from accurately explaining scrapple because then nobody will want to order it. She told us it was a “fried pork product.” Bailey, the truth teller and keeper of no secrets, broke it right on down for us that scrapple is the result of all the formerly unwanted parts of the pig, “from the snout to the tail,” that are cooked and eventually fried. Well. Okay. Dig in. It looked sort of like sausage. It tasted sort of like sausage with similar seasoning and a similar texture. Yet, there was something fundamentally different. Mostly I tasted pork and sage which isn’t so bad. I admit, I ate more than one bite. It was strangely curious to me. Intellectually, I am sort of grossed out, to be honest. Yet, my mouth wasn’t grossed out by eating it, leaving me conflicted. 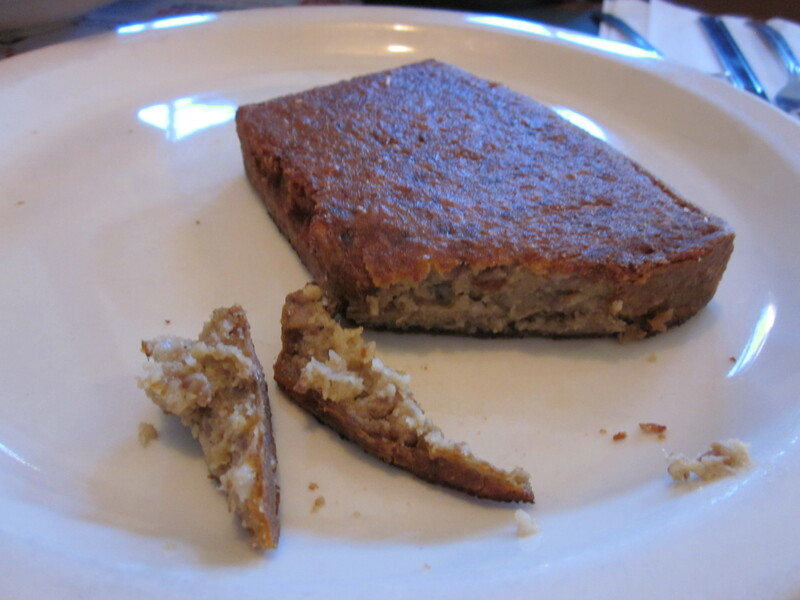 I can promise you that a recipe for scrapple will never, ever, ever appear on this blog except by way of a brave guest blogger. I looked up a recipe, and it’s too much for me. I did learn from the recipe that a primary difference between scrapple and sausage is the inclusion of cornmeal. I’m pretty sure if I was with a native Philadelphian in Philly again and it was ordered, I’d probably eat a couple of bites. Here is a whole lot of info on scrapple if you feel like you need way more details than I’ve given you. But, gentle eater, click at your own risk. Once you know, you can’t unknow, trust me. I ate a few other restaurants that were all really good, and there are still others that I want to try the next time I go. Smokin’ Betty’s was very delicious. Mugshots Coffeeshop had very good food and was quite thematic for being across the street from a prison. Dunkin’ Donuts has QUITE the presence up there, and I had breakfast there many mornings. We don’t have them down here, really, and I’m mostly a Shipley’s gal so DD was an out-of-the-box experience for me. The coffee was good so I feel like it met my expectations there. You may want to skip the sugar or ask them to go lightly on it; they aren’t shy with it. They also have a lot of flavors which I always appreciate. 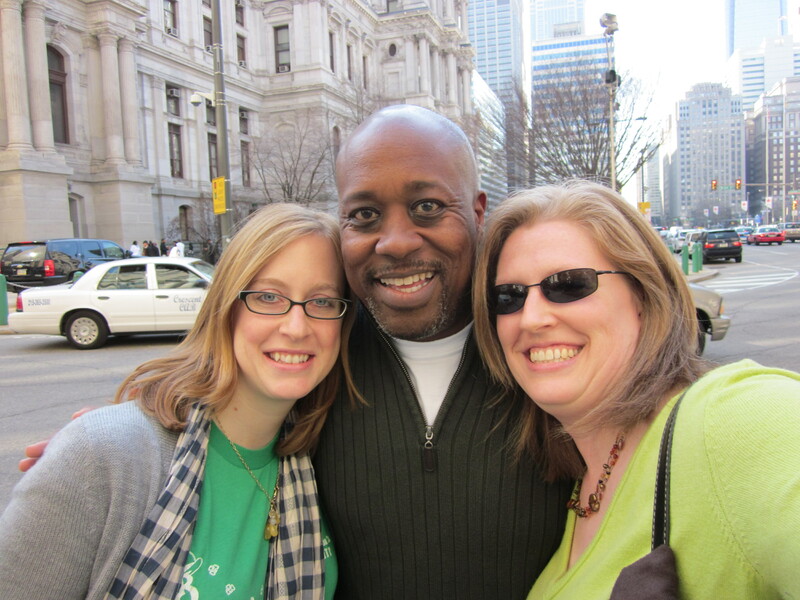 I had no idea when I went that Philadelphia would be such a culinary delight so I was surprised in an enjoyable way. It was happy eating all week long, scrapple included!